We want to save you time and money, and make it quicker and easier for you to comply with the law. Local regulation takes many forms. It includes trading standards, environmental health, animal health, licensing, planning and fire and community safety. If you are running a business in the West of England we need your help to develop a new approach to how we regulate you. 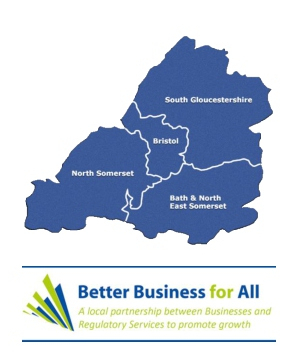 Reducing the impact of red tape on business is a priority for Bath and North East Somerset, Bristol, North Somerset and South Gloucestershire Councils. That’s why we've set up a new project between businesses, the West of England Growth Hub, business representatives and local regulators called 'Better Business for All'. Please take 5 minutes to give us your honest feedback about your experiences of regulation and how you think we can make the process quicker and easier for you. * 4. Which of the following best describes the stage your business is at? * 8. How much do you agree with the following statements about your local regulators? * 9. Do you think your local regulators have a good understanding of the following? * 11. If you could change one thing about the way regulation is delivered locally what would it be? * 12. If you would like more details about this project, or would like to get involved in shaping how regulation is delivered in the West of England please include your contact email address below.